Winner announced for Fabricworm Holiday Hoot Winner! Let's give a big congratulations to Angela McNaul! 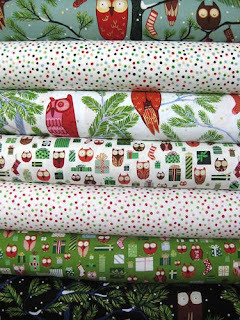 You won our weekly Fat Quarter Bundle Giveaway for 7 fat quarters from the Alexander Henry Holiday Hoot Collection pictured below. We will be sending you an email so that you can give us your address! Don't forget to come back tomorrow for another great giveaway from Fabricworm! OMG No way! Thank you soooo much!! Whoot! Oh how exciting Angela! Congratulation! Enjoy your goodies. woot woot to Angela! Congratulations!!! Congrats to ANgela...can I say "Jealous"?